Dethroning Music or Restoring Context? There is much understandable consternation that the Victoria and Albert Museum, with one of the great musical-instrument collections of the world, is shutting down their galleries for these instruments — in favor of an enlargement of their display of costume and fashion. At first blush, I was alarmed at this. 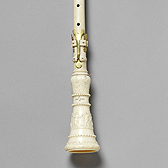 When I was a young pup, I interned in our own national collection of musical instruments at the Smithsonian, and one of the guiding lights we looked to for conservation and display was the sister operation at the V&A. But while other collections, like those of the Metropolitan Museum or Yale, seem to flourish (the Met is even now building new galleries for their own), the V&A is shutting their dedicated gallery down. I remember being told right away at the Smithsonian that a big difference between that collection and that of the V&A was that the London museum classified musical instruments as furniture, whereas Washington put them under history and technology. The resulting difference in attitude can of course be a major one. As a thoughtful, if alarmist, Evening Standard article points out, the classical-music business is booming in London, and such a cutback might seem rather counterintuitive, if not mad. What the article doesn’t mention is that the instrument galleries at the V&A have been open only one day a month, so that the intention of distributing historical examples around the museum into other appropriate galleries might in fact increase the exposure of the objects. And, more to the point, it might greatly increase their impact. For, in fact, there are two main reasons for such collections. 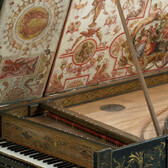 One is that they are a resource for historians and for makers of musical instruments. Only a fraction of this huge collection has ever been on exhibit, and the rest are stored for research and conservation purposes. These uses will not be impeded by the new arrangements — in fact, they might well be enhanced, since objects on display were not available for this kind of examination. The other purpose was for the education of the public. But this meant that only the people who were motivated to go to the musical-instrument galleries got the benefit of the information that these displays could impart. Might it in fact carry a much larger intellectual and cultural payload for people to encounter Queen Elizabeth’s virginal in a context of, say, Tudor furniture? Or to come upon a dancing-master’s violin in a context involving social life, education, or aristocratic homelife? An African thumb-piano might be much more at-home surrounded by sculptures from its own tribe rather than being in a gallery with a Cristofori piano. Far be it from me to forestall anyone’s pleasure in the sort of default doom-and-gloom that infects so much of our “high” cultural life. Therefore, I’m not contradicting the concern over this issue (which now has a Facebook page, which I was happy to join). If Sir Roy Strong were still running the V&A, I’d feel quite confident that an enlightened strategy was afoot. I know little about the current régime but see no reason not to hope for the best. Nothing, it would seem, about the announced measures are irreversible, and these were galleries that — even apart from their being almost entirely closed to the public — were clearly in desperate need of revitalization. So the public debate can only be healthy — so long as we recall that fruitful debate is never one-sided.